A large bull cape buffalo, among a herd on the move and kicking up dust, pauses to stare down the stranger in Zambia’s Kafue National Park. When I traveled through Zambia recently, the new president had been in office less than 2 months. There was a definite sense of optimism among the people regarding their country’s prospects. I really think the fact that the election was free of violence (a rarity in most African countries) had almost as much to do with this optimism as did the new president himself. The country is riding a boom in commodity prices, sitting on huge copper reserves, with China’s investment in and demand for raw commodities being the primary driver. And so while walking the streets of Lusaka, or even in Livingstone, near the tourist magnet of Victoria Falls, it was not only easy to engage in small talk with the average Zambian, it was also fairly easy to come across those willing to speak about their country’s future. All seems to depend on how the country invests in infrastructure, education and agriculture in order to avoid the typical boom-bust cycle of a commodity-dependent country. But in this way Zambia is in the company of countries like Australia, which is not a bad place to be considering the alternative (Mali, etc.). An academic at Columbia recently wrote an article in the New York Times claiming that Africa was the new Asia, and he put forth Zambia as a prime example. Well there are a few very serious obstacles to growth that Africa has and Asia does not, so to me the analogy seems way overstated, but the general point is valid. Africa is doing better as a whole these days, and societies are modernizing, spawning more and more consumers as the village culture is steadily being pushed to the edge. But this blog post is not all about African economics and politics. It’s about a place in western Zambia called Kafue. Kafue National Park is not as famous as South Luangwa in the country’s east – that park has just recently become as popular as big and famous safari parks like Kruger in South Africa. Kafue is, of course, well known to experienced African travelers, because of its size and sense of wildness, and because it has a very remote feel to it, without actually being all that inaccessible. It only takes a few hours to drive to the park from the capital city of Lusaka, and that same decent, paved road traverses the middle of the park. In order to visit the northern or southern reaches of Kafue however, a 4×4 is necessary. Obviously the lead hippo is the one in charge of this pod, and he doesn’t much like the guy in the boat holding the camera. This was to be the first time I would rent a 4×4 in Africa, and I experienced some sticker shock when I was told what it would cost. I couldn’t really afford $200-250/day for the week I planned to spend in Kafue, so I asked around the backpacker lodge I was staying at and soon met a guy who knew a guy. I checked out the pickup that two young Zambians brought to me, and it looked okay. It was a Ford of all things, similar to a Ranger. Although I was able to haggle and get it for $100/day, I was to soon regret my decision to rent from these young “entrepeneurs”. Later, while driving the lonely road across the park, not far from the camp I was heading for along the Kafue River, it happened. It coughed a few times, then quit on me. I couldn’t start it. I got out and looked it over, but while I was leaning over the engine with the hood up, I suddenly stood up straight. This was no good at all. Dusk was rapidly descending, and I was in the middle of an African park, a preserved area with all manner of wildlife roaming free. I could see this situation going from bad to worse in a hurry if a pride of lions began to stalk me, or an angry buffalo or elephant took exception to my presence. I couldn’t look at the engine again. In fact, I literally tripped over myself getting back in the truck. Soon however, the first vehicle showed up, and it happened to be a group of gregarious Zambian friends who happily picked me up and took me to the nearest town to the park border, where there was cell phone service. I won’t recount what I said to my friends in Lusaka, but suffice to say I insisted on another truck being delivered to me. My saviours took me to a small hotel where I checked in. There was something about the woman who helped me, but I forgot about it as the guys insisted that we go get something to eat. Later, after they finally dropped me off, I saw the woman again, and spoke to her. Then I realized, she had a different accent than I had been hearing, and seemed very simple and pure. She was straight out of a village in remote NW Zambia, and was just different. She spoke some English, but it was more broken than I had been used to in my travels thus far. In Africa, most people speak English quite well. They learn from their first year in school, so it’s only in small rural villages, which lack good education, where you’ll find people who don’t speak English. 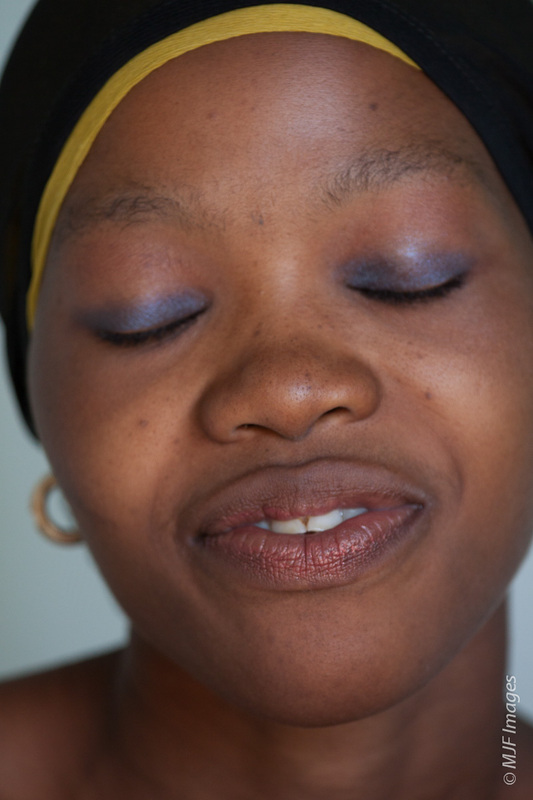 Africa is beautiful: a young western Zambian woman. I was charmed by the woman’s innocence. I talked to her for quite some time, in that awkward but funny and charming way that two people speak who only comprehend a part of what the other is saying. As a nice breeze finally appeared, I sighed and thought how different things had turned out. Not long before I was preparing for a long, sleepless night barricaded in my truck, hoping that no elephant decided to roll this little toy over. Now I was chatting with a beautiful African girl while the stars twinkled in the black sky. Such are the twists and turns of travel. This was to be a night, given my limited experience with women of other races, that I would remember. The guys came through for me, delivering a blue Mitsubishi 4×4 next morning. Little did I know as they drove off in the stuttering Ford that I’d be seeing them again at Kafue. 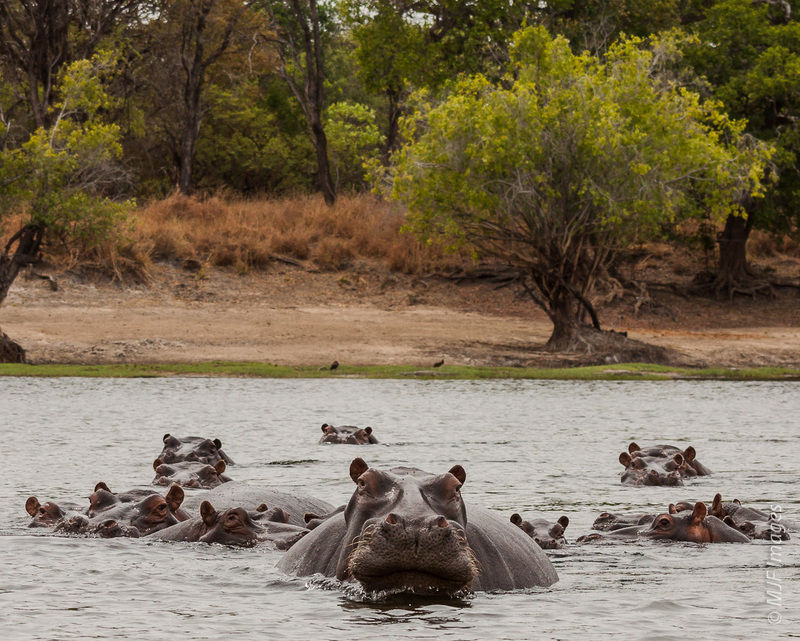 While camping along the Kafue River at Camp, I watched from my small one-man tent as hippos grazed in the night mere yards away, their small bright eyes giving lie to the enormous bulk and giant mouths behind those eyes. I also did my first game drive where I was driver and tourist packaged in one. It takes real skill, I found, to be able to drive rutted and narrow dirt tracks while keeping an eagle eye out for wildlife. It was getting hot in Africa, toward the end of the dry season, and late afternoon one day in Kafue I just had to break down and take a quick dip in the river. I walked up to where some rocky rapids lay upstream from camp, and jumped in then out, wasting no time splashing around. I was pretty sure the crocs and hippos would not be interested in rapids, so felt pretty safe. Later, at dinner, I let slip what I had done and the guide and few other tourists there just shook their heads. Next day, while walking again up along the rapids, I spotted the biggest crocodile I had ever seen, staking out a spot right next to the biggest rapid. He must have gotten word on the predator hotline that there was a dumb tourist swimming there the day before. 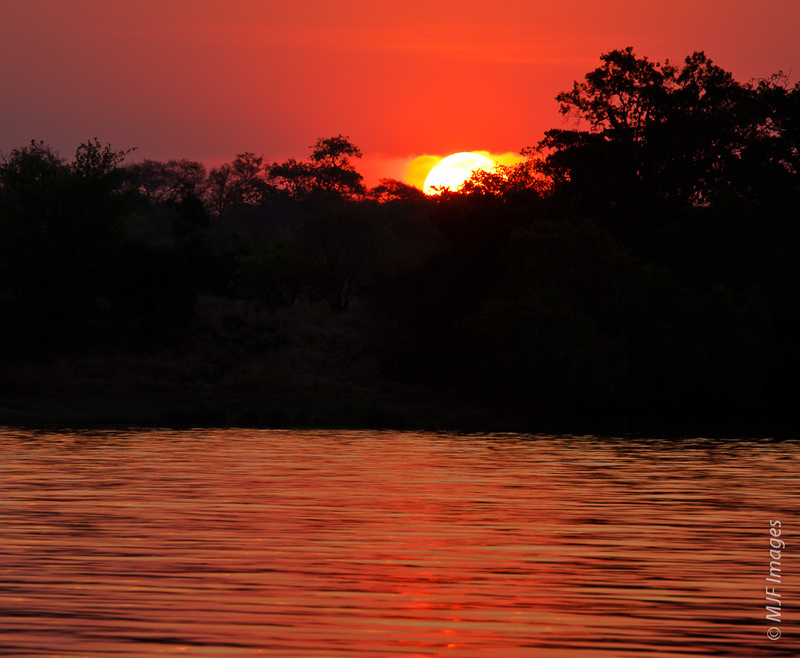 The sun passes below the horizon after a 100 degree-plus day along the Kafue River, western Zambia.